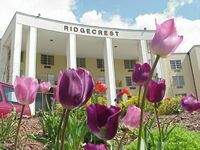 Ridgecrest is a year-round conference and retreat facility owned by the LifeWay Christian Resources. However, Ridgecrest hosts many other denominations and non-profit groups each year. We can house between 1,000 and 2,300 guests on campus, and our facilities include a 2,100 seat auditorium, over 65 conference rooms, a large dining facility, a LifeWay Bookstore, nature trails, a recreation area with gymnasium, tennis courts, putt-putt, ball fields, and more. Ridgecrest Vision Statement: "We will help people discover Biblical solutions for life by hosting, conducting, and delivering conferences and events that transform individuals and cultures." Meeting Equipment Technology Available: Sound Systems, TV's, VCR's, Data/Video Projection, Screens, Overhead Projector, CD and Cassette Players, Piano's, Podiums, Whiteboards. Follow I-40 to Exit 66 Just East of Black Mountain, NC. Follow the signs From the Exit to Ridgecrest's Main Entrance.